You may be over Earth Day, but here in spinach land we’re just getting started with our weeklong tribute to Earth Day. This week we’re highlighting what we think are our planet’s greatest challenges. I’d like to bring attention to our car-designed cities. I haven’t owned a car for two years (some people say omg how do you live without a car?! ); I find it invigorating. Not all cities were built around a train or bus system like NY, DC, and a few others. There are a couple DC food blogs (and perhaps other blog types too) that hype up the so-called NY-DC rivalry. I’m sure this leaves NY-ers saying, rivalry whaaat? And DC-ers saying oh yeah the DC food scene is very up and coming. That aside, (as my Northern Jersey roots say there’s no place like NY despite my love for the District) DC takes the cake for showing its love for…the bicycle. 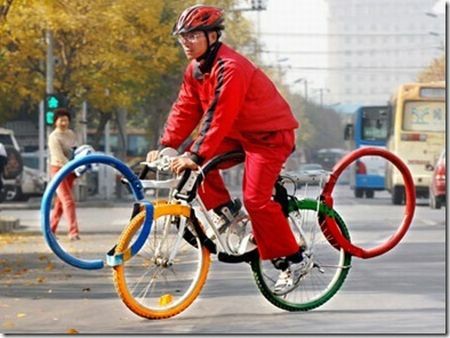 A bicycle tribute to the upcoming Summer Olympics. Just this week Wmata (Washington’s metro service) announced plans for a pilot bike & ride facility. I love this concept, Green Light approved. The pilot facility will be at the University of Maryland’s College Park metro station and will hold up to 100 bikes in a secure room and the cost to the cyclist, ready…2 to 5 cents per hour! Now that’s a cheap parking garage. DC also started the famous Capital Bikeshare which NY is starting this summer. With bikeshare you pick up and pay as you go or have a monthly membership to bicycle all over town as much or as little as you like and then drop off the bike at the closest docking station near you (there’s an app for that). I hope more cities do bike and ride garages; biking perks are endless – exercise (great way to clear your head), no 4.00/gallon fuel, less road rage, and clean air, it doesn’t get better than that. So, grab a bike, take a walk, request better public transportation near you, and drive less when you can. Cheers.